The article below is an update to the original one I posted. There is one thing that caught my attention in the video of Liberia hospital and it was that the patients infected were placed in a dark enclosed shack. I would do the exact apposite. The place should have direct sunlight for at least two times a day, one hour of time at any time from 8 to 10 and one hour from 4 to 6 PM. The area must receive enough light as well as the patients. The sun helps in healing also. The other thing to do is give the patients at least a total of 8 to 10 liters of water per day. All this is common sense. The news today has a second nurse in Texas with the Ebola virus, and from the amount of people that came in contact with Duncan the first Ebola death in the USA there may be other cases lurking in the shadows yet uncovered. The treatment that is presented in this article is suggested to be implemented along with any other treatment that modern medicine can believe to work and not to exclude these treatments. But if other treatments are not available it may prolong live in an infected person long enough to let the immune system work in killing the virus. God is the real healer here when He gave us such an efficient defense as our immune system, but this virus seems to act so fast and lethally that we do not have time for the body to defend itself. Because the virus is so lethal and fast I would start the protocol at its peak doses of 25 drops (35% pure) in 8 oz of distilled or rain water every 8 hours and continue the protocol as in the link to gradually go down. If 35 % pure h2o2 is not available the 3% sold in most pharmacies has to be used as an alternate remember that you need 12 times as much so 25 drops you need 300 drops. One fluid ounce = 591.5 drops. This protocol may need to be adjusted up or down to combat this or other pathogens that threaten our bodies and it may not work at all, but if it was me I WOULD TRY IT. As the Bible points out in the book of Rev:6 The four horses are given power to kill 1/4 of humanity and plagues are mentioned there as one of the causes so you figure it out on whose side you will be in this final battle. The statistics of the people getting this virus seem to suggest it is spreading airborne. It is lethal as more than 50% die. At present the medical treatments seem none existent so let me say my opinion as an engineer and cultured person not a doctor in medicine. In a lethal war where the enemy is overwhelming the first thing to do is slow the enemy down if possible to muster enough forces to fight it. God created humans with a defensive mechanism to fight disease to guarantee the survival of the species, and He also created animals with this capacity. This virus is so lethal and it reproduces so fast that the present precautions to stop it are not effective. There is a weapon that I think could be effective to delay the spreading of this virus from overwhelming the body defenses and it is hydrogen peroxide. Placed in a spray bottle it will disinfect, kill any virus that it comes in contact with. The other method of use I would use is ingesting very small amounts mixed with an 8 onz glass of water. The type of H2O2 required is the 35% food grade and this type and strength could probably not be readily available in places where the virus is prevalent. The standard hydrogen peroxide sold in most pharmacies is the 3% H2O2. This type also contains preservative chemicals that could cause diarrhea at some doses. The strength of this type is about twelve times less strong than the other. In an emergency I would use this type and use twelve times more of it. Three drops in an 8 onz. glass of distilled water or rain water every 8 hours on the first day. The second day increase to four drops in 8 onz. of water every 8 hours, and repeat adding one drop every day till you reach 25 drops three times a day. Hold this dose for seven days and then go back down at the same rate reducing it till you reach three drops three times per day. I have used three drops once a day for a period of three years and had no ill effects. I have also followed the protocol till the seven drops three times a day and it fell strong in my stomach, maybe gas from the oxygen. I have never gone the 25 drops 3 times / day, but I have never had a serious sickness either. In my opinion this will not be a cure but it could be a weapon used to give a chance for the body immune system time to combat the virus by delaying the multiplication of the virus in the blood. Pray to Jesus Christ constantly to help you heal. The Moringa tree is known for its health and nutritious properties. A friend of mine has had the tree for several years now and I will get a branch and plant it in my backyard. The leaves of the moringa trees may be the world’s most nutritious green—and they’re coming to a health-food store near you. Remember the moment when every runway regular suddenly became a supermodel? Now every healthy edible wants to be called a superfood. Which is why even that term likely doesn’t do justice to moringa, a tree leaf that contains more nutrients and natural remedies than your body knows what to do with. Ancient warriors fueled for battle with the leaf extract, hot for the stamina and strength it gave them; and legend has it that Egyptian Pharaohs were buried with it to sustain them in the afterlife. Health-savvy Americans are the latest followers, thanks to the energy, immunity, and metabolism boosts moringa delivers. “Moringa has incredibly nutritious qualities—it has 3.5 times the calcium of milk and 4 times the vitamin C of oranges,” says David Wolfe, author of Superfoods. All you have to do is open the bag and let the good nutrients roll. A recent analysis of the leaves found that moringa contains more vitamin A than carrots, more iron than spinach, and more potassium than bananas. It also packs as much protein as milk or eggs. If you can get your hands on the fresh leaves (not a grocery-store staple yet, as they mostly grow in southern Florida and California), expect a lemony, peppery spinach taste. Add to a salad mix or sauté. Skip expensive supplements and add the dry powder—which is just as nutritious as the leaves, says Johns Hopkins nutritional biochemist Jed Fahey—to smoothies or drinks (try Organic India Moringa Leaf Powder, vitaminshoppe.com). Sip moringa tea (republicoftea.com) or drink a moringa beverage (zijamoringa.com) straight up. Mostly online and in supplement stores. A new snack bar made with moringa from Kuli Kuli is launching this month, and the superfood is hitting the restaurant scene: Sarma Melngailis, owner of Pure Food and Wine in New York City, says she’ll be adding moringa to some items on the menu soon. The antioxidant-rich oil pressed from the seeds of the tree is revered by skin-care companies for its ability to moisturize and revive skin. Here are three products to try. Like olive oil, which has a similar makeup, moringa gently lifts dirt without leaving skin parched. This moisturizer improves skin complexion thanks to its vitamin C content. The oil’s anti-inflammatory properties make it ideal for healing minor skin irritations. “The leaves of the tree were for the healing of the nations” (Revelation 22:2). Have we found the tree to which the writer of Revelation refers? I don’t know, but this tree will do until the real tree comes along. That is, until recently. Now there are THREE, and I am excited that this last one is probably the best of all. In light of that Scripture above, I am not surprised it is a tree! A video documentary (see link below) calls it “a Divine tree.” I believe it! It is called “the wonder tree.” This “wonder” treats or prevents more than 300 diseases. Moringa has gained international acclaim as “The Miracle Tree” that can cure all ailments and also be taken as a powerful weight loss supplement. Another property of the Moringa leaf is its soothing ability, causing it to lower blood pressure and promote good sleep. I don’t know how I missed this the past 40 years. It’s not exactly a secret, but you might think so. Several companies are now marketing it. On his TV show, Dr. Oz has described Moringa Oleifera as an energy blaster and “great way to kick start your day”! Moringa has also been featured on ABC’S ‘The View’ during which a celebrity nutrition expert remarked that this incredible super food is “a perfect alternative for anyone who is seeking a weight loss supplement loaded with nutrients”. He points out that the incredibly high nutrient content of Moringa enables it to feed our bodies with all the nutrients we need to feel satiated; so that we no longer crave fatty, high sugar foods to make up for a lack of nutrition. Most recently, a study published in the Trees for Life Journal revealed that Moringa contains a high density of the vitamins needed to convert food into energy, rather than storing it as fat. The full clinical study can be found by clicking here: http://www.tfljournal.org/article.php/20051201124931586. The way the knowledge of Moringa came to me was strange, seemingly supernatural. One day I got a telephone call out of the blue from an old friend I had not heard from in years. The day was June 7, a biblically prophetic and historic day – the day in 1967 when Israel won the miraculous Six-Day War and retook the Temple Mount in Jerusalem. The friend was Reggie, formerly from my church in Lake Mary, Florida, near Orlando. He described several miracle cures from Moringa in his own life, including an ugly gangrene condition in his feet that quickly healed. I was convinced even before I hung up. As mentioned, I am reminded of the Scripture, “The leaves of the tree were for the healing of the nations” (Revelation 22:2). I noted that the word “tree” is used in that verse, not just plant or bush, and the word tree is from the Greek word xulon, which is the name of the publisher of my 2003 book, “The Power.” Surely, Moringa has the power! Reggie is obtaining Moringa from a leading company, Zija International. When the current President of the company, Ken Brailsford, first heard about the miracle of Moringa, he was so impressed that he came out of retirement to found Zija International with a friend. Formerly Ken was a pioneer in the nutritional supplement industry and is called the “Father of Herbal Encapsulation.” He says he was “spiritually motivated” to start the Zija company. Scientist Russ Bianchi discusses the science behind Zija International and Moringa at http://www.youtube.com/watch?v=ZhKLU9JPmpw. To ensure the highest quality possible, all of Zija’s Moringa trees are grown on proprietary farms in India. They are organically raised without chemicals, harvested carefully by hand, and then shade dried, ensuring that essential nutrients remain intact. They use all of the most beneficial parts of the tree – the leaves, the seeds and the fruit. I do not sell the product myself, but you can get it at http://www.2433332.myzija.com . Zija is a network marketing company. But you don’t have to join if you don’t want to. As I did initially, you can purchase it simply as a “preferred customer.” Many modern companies use the strategy of network marketing to get their product into the marketplace while saving millions in advertising costs, using word of mouth, the way I first heard about it and am now telling you. Network marketing also avoids the stiff competition for limited shelf space in stores. But if you join, the price of your personal product use can be recouped by telling 2-3 other people about it. This is a classy company in which I have great confidence. There are other companies on the Internet offering Moringa but for various reasons I do not fully trust them. Do you want to maximize your health? Are you suffering from some chronic condition for which drugs have not helped? Do you want to avoid such future conditions, and drugs? Are you overweight? If you want to have your own business, Zija would be perfect for you! You even have my permission to use this letter to introduce the opportunity to others. What I have shared here represents a lot of valuable, personal research. Again, click on http://www.2433332.myzija.com and you can enter a whole new life and be blessed by one of God’s greatest and most unique creations – the Divine Moringa Oleifera tree! The following article contains a video that explains the harmful effects of modern day wheat products in causing overweight and diabetes. It shows that these wheat products are highly addictive and compares them to addiction to opium. My daily diet is heavily dependent on wheat products and the consequences of it is that I am highly overweight. I am going to try to change this pattern of eating and see if the results are weight loss. I will keep you informed in the future. Give up wheat and gain good health. That’s the message from Dr. William Davis, a Wisconsin cardiologist and author of the best-seller, “Wheat Belly: Lose the Wheat, Lose the Weight, and Find Your Path Back to Health.” He tells Newsmax Health that if we banish wheat from our diet, we’ll also lose weight, lower our blood sugar, relieve intestinal problems, reduce dangerous inflammation, gain energy, and just plain feel better. Why? Davis maintains that today’s wheat products are made from genetically modified plants that contain harmful compounds that contribute to weight gain and other serious health woes. One of those substances is gliadin protein, which acts as an appetite stimulant. When it was introduced in the mid-1980s, calorie consumption skyrocketed by an average of 440 calories per day, per person, he says. “This gliadin acts as an opiate, but this opiate … does not cause pain relief; it only causes addiction and stimulation of appetite,” he says. “This is one of the reasons why wheat, and not fat, gluttony, or a sedentary lifestyle, is to blame for soaring rates of obesity and diabetes, he says. Amylopectin A is another culprit. This complex carbohydrate is unique to wheat, more easily digestible than amylopectin B and C found in rice and beans, and can send blood sugar sky high, higher than sugar and candy can, he explains. Wheat Belly: #1 Diet and Health Book in America is Changing Lives –Only $4.95 with Special Offer. Click Here Now. Wheat germ agglutinin, another wheat protein, causes intestinal destruction when given to rats in a purified form. Humans eat much smaller amounts of the non-purified substance but that also hurts intestinal health, contributing to acid reflux, irritable bowel syndrome, and the worsening of ulcerative colitis and Crohn’s disease, he says. Davis was compelled to write his book after realizing that 80 percent of his patients suffered from heart disease, diabetes, or a pre-diabetes — and whole wheat bread was a big part of their diets. He wondered what would happen if they stopped eating it. “The benefits are much larger than you ever anticipate,” he says. It’s common for many people to drop 18 to 20 pounds during their first wheat-free month, he says. Blood sugar and appetite drop, and waistlines decrease by two to three inches during the first four to six weeks. What’s more, joint pain gets better and acid reflux and other intestinal symptoms improve. Most organ systems benefit from going wheat free, he says. 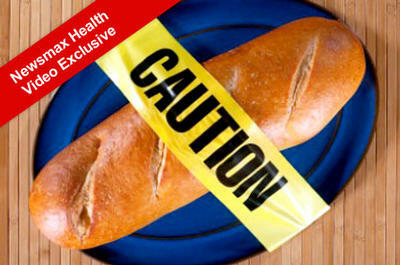 Considering the many food products that contain wheat, opting for a simplified diet is key to going wheat free. Davis is quick to dismiss the idea that the popularity of his book and the idea of going wheat free may be nothing more than a fad. The interest stems from a growing desire of consumers to have more control over what they eat, he maintains. Important: At Risk For A Heart Attack? Find Out Now. The fact is this; Jesus is the truth, the way and the Almighty God, Creator and sustainer of the Universe. The Bible is truth spoken by God and He keeps His family (the believers) protected and healthy. The testimony below gives validity to the Word. Suddenly I had a flash of revelation that there have been many more victims of the “Doubt Movement,” which pervades much of the church today. The Doubt Movement is responsible for untold suffering, unnecessary sicknesses, and millions of premature deaths. If God’s people just believed and acted upon James 5:13-15, many hospitals would be emptied. The Faith Movement has really been mislabeled. It should more properly be called the “Faith in Jesus Movement,” or “The Bible Is Really True” movement. The anti-faith movement should be called the “Jesus Lied” movement, or “The Bible is Not Really True” movement. Years ago I discovered that Jesus cannot lie (Titus 1:2) and that the Bible is totally true (2 Timothy 3:16). I made a decision to believe it. That decision radically changed my life, gave me purpose and hope, and brought multiple blessings my way, including long life and many physical healings. I am glad I never listened to the anti-faith people, or I would be dead now. They ought to go join some other religion. Theirs is not biblical Christianity. Many more testimonies of supernatural healings of mine and others can be found in Appendix 1 of my book, “The Power,” available free at http://www.choicesforliving.com/book/The-Power-1.pdf (page 111). As a testimony of the reliability of God’s Word, I will be age 82 this year and I have not been inside a doctor’s office in almost 25 years, not even for a physical. I have had some physical challenges, but faith in God’s Word always resolved them. “Therefore I say to you, whatever things you ask when you pray, believe that you receive them, and you will have them” (Matthew 11:24). This article was sent to me by e-mail and in Spanish so I used the translator to change it into English and here it is for your use and dissemination. Very interesting article, read it all and change our bad eating habits …. Did you know that in 1931 a scientist received the Nobel Prize for discovering the primary cause of cancer? According to this scientist, cancer is the consequence of eating and antiphysiological antiphysiological lifestyle …. BEFORE PROCEEDING: Once the process of digestion of foods according to the quality of proteins, carbohydrates, fats, minerals and vitamins they provide, creates a condition of acidity or alkalinity of the body. Acidifying or alkalizing The result is measured by a scale called pH, whose values ​​are in the range of 0 to 14, with the PH PHneutro July 1. It is important to know how they affect health, the acid and alkaline foods, as for cells to function properly and adjust its pH should be slightly alkaline. In a healthy person the blood’s pH is between 7.40 and 7.45. Note that if the blood pH, fell below 7, go into a coma near death. # Refined flour and all products (pastries, cookies, etc.). # Any cooked food (cooking removes oxygen and transforms Enaco) including cooked vegetables. # Everything that contains preservatives, colorings, flavorings, stabilizers, etc.. In short: all packaged foods. Keep in mind that in the modern lifestyle, these foods are consumed 5 times a day, 365 days a year! Interestingly all these foods appointed antiphysiological ! !… Our bodies are not designed to digest all that crap! # All raw vegetables (but some are acidic reaction in the body are alkalizing, slightly acidifying, but others are bringing them the necessary foundation for proper balance) and provide oxygen raw, cooked, no. # Fruits, like vegetables, but for example the lemon has a pH of about 2.2, but within the organism is highly alkalizing effect (perhaps the most powerful of all). Fruits provide healthy amounts of oxygen. # Seeds: apart from all its benefits, are highly alkalizing such as almonds. # Grains: The only alkalizing grain is millet, all others are slightly acidifying but very healthy! .. All should be eaten cooked. Dr. Theodore A. Baroody says in his book “Alkalize or Die” (alkalize or die): “It does not matter the countless names of illnesses. What matters is that they all come from the same root cause … many acidic wastes in body “. Dr. Robert O Young said: “Excessive acidification in the body is the cause of all degenerative diseases. When the balance is broken and the body starts to produce and store more acidity and toxic waste than it can then manifest various ailments. I will not go into details, but I’ll just state the obvious: Chemotherapy acidifies the body to such an extent that it must draw on reserves immediately alkaline to neutralize acidity so, sacrificing mineral bases (Calcium, Magnesium, Potassium) deposited in bones, teeth, nails, joints, nails and hair. That is why such degradation is observed in people receiving this treatment, among many other things, they like high-speed hair. For the body does not mean anything to stay bald, but a death significaríala acid PH. Necessary to mention that this was not disclosed because the cancer industry and chemotherapy are one of the businesses there are more billionaires today? In saying that the pharmaceutical industry and food industry are a single entity? How many of us have heard the news of someone who has cancer and whenever someone says “what if … you can touch anyone …” Anyone? Ignorance justifies … knowledge, conviction. Let food be your medicine, your medicine be food. Hippocrates.